Noah received generally positive reviews from critics and grossed over $362 million worldwide, making it Aronofsky's highest-grossing film to date. It was praised for its direction and acting, but generated controversy, primarily due to its lack of racial diversity, its perceived left-leaning political messages and its extensive use of non-biblical sources for inspiration such as the Book of Enoch. It was banned in China for "religion-related reason". Also, it was banned in several Muslim countries because it was seen as contradicting the teachings of Islam. As a young boy, Noah witnesses his father, Lamech, killed by a young Tubal-cain. Years later, an adult Noah lives with his wife Naameh and their sons Shem, Ham, and Japheth. After seeing a flower grow instantly from the ground and being haunted by dreams of a great flood, Noah takes them to visit his grandfather Methuselah. They encounter a group of people recently killed and take in and adopt the lone survivor, a girl named Ila. Ila is treated for an abdominal wound and will survive, but Naameh determines that she will be unable to have children. Noah and his family are chased by the murderers and seek refuge with the fallen angels known as the "Watchers", in whose territory Methuselah lives. The Watchers are confined on Earth as creatures of stone for helping humans banished from the Garden of Eden. Methuselah gives Noah a seed from Eden and tells Noah that he was chosen for a reason. Returning to his tent that night, Noah plants the seed in the ground. The Watchers arrive the next morning and debate whether they should help Noah until they see water spout from the spot where Noah planted the seed. After a forest grows instantly, the Watchers agree to help Noah and his family build an ark. After birds fly to the ark, Tubal-cain arrives with his followers and confronts Noah. Noah defies Tubal-cain and remarks that there is no escape for the line of Cain. Tubal-cain retreats and decides to build weapons to defeat the Watchers and take the ark. As the ark nears completion, animals of various species enter the ark and are sedated with incense. With Ila having become enamored of Shem, Noah goes to a nearby settlement to find wives for Ham and Japheth but, seeing the settlers selling their daughters for food, he abandons his effort and begins believing that the Creator wants all of humanity dead. He tells his family that he will not seek wives for his younger sons. After the flood, they will be the last humans and there will be no new human generations. Devastated that he will be alone his entire life, Ham runs into the forest. Naameh begs Noah to reconsider but, when he will not, she goes to Methuselah for help. Ila encounters Methuselah who cures her infertility. Ham, searching for a wife on his own, befriends the refugee Na'el. After it starts raining, Tubal-cain becomes angry that he was not chosen to be saved and incites his followers to make a run for the ark. Noah finds Ham in the forest and forces Ham to save himself, but leaves Na'el to die when she is caught in an animal trap. Noah's family enter the ark except for Methuselah, who remains in the forest and is swept away by the rushing waters. The Watchers fight off Tubal-cain and his mob of followers, sacrificing themselves and ascending to heaven, their reward for protecting Noah. As the flood drowns the remaining humans, an injured Tubal-cain climbs onto the ark and solicits Ham, playing on anger toward Noah for allowing Na'el to die. Ila discovers she is pregnant as the rains stop and begs the Creator to let the child live. Noah interprets the ending of the rain to mean he must ensure the extinction of humans and, against his wife's protests, resolves that, if the child is a girl, he will kill her. Months pass, and Ila and Shem build a raft to escape Noah's resolve, but Noah discovers and burns it. Ila then starts feeling labor pains and gives birth to twin girls. After Ham calls Noah telling him the beasts are awake and eating each other, Tubal-cain emerges and attempts to hit Noah. Noah and Tubal-cain engage in combat. Shem promises Ila that Noah will not harm their daughters and goes to stop him. He attacks Noah as Tubal-cain falls to the ground only to be knocked out. Tubal-cain eventually forces Noah to the edge of the raft, but Ham kills him with a dagger before he can shove Noah in the ocean. Noah picks himself up and finds Ila and the babies, intending to kill the children, but spares them upon looking at his granddaughters and only feeling love. Upon exiting the ark on the new land, a shameful Noah goes into isolation in a nearby cave, making wine in which to drown his sorrows. Ham expresses disappointment for his father's current state of unseemly drunkenness and nakedness before leaving his kin to live alone. Having reconciled at the behest of Ila, Noah blesses the family as the beginning of a new human race and all witness waves of immense celestial rainbows. Aronofsky first became interested in the story of Noah in the seventh grade. As part of a creative writing assignment, he submitted a poem about Noah entitled "The Dove". Years later, after finishing the movie Pi, Aronofsky was searching for ideas for his next movie and thought that a movie about Noah would be a good idea. Work on the script began in 2000 but Aronofsky put the project on hold when he learned Hallmark was already working on a similar movie. Work on the draft resumed sometime later, and a first draft was completed in 2003. In adapting the story for a feature film Aronofsky struggled with how to adapt it to feature length—the story in the Bible is only four chapters and does not include names for his wife or his sons' wives. The text does mention Noah getting drunk after the flood and getting into an altercation with one of his sons, which provided Aronofsky and his team with ideas into what events could have taken place on the ark. Aronofsky first discussed Noah with The Guardian in April 2007, explaining that he saw Noah as "a dark, complicated character" who experiences "real survivor's guilt" after the flood. Aronofsky was working on early drafts of the script for Noah around the time his first attempt to make The Fountain fell through when actor Brad Pitt left the project. Ari Handel—Aronofsky's collaborator on The Fountain, The Wrestler, and Black Swan—helped Aronofsky develop the script. Before they found financial backing for Noah, they collaborated with Canadian artist Niko Henrichon to adapt the script into a graphic novel. The first volume of the graphic novel was released in the French language by Belgian publisher Le Lombard in October 2011 under the title Noé: Pour la cruauté des hommes (Noah: For the Cruelty of Men). After the creation of the graphic novel, Aronofsky struck a deal with Paramount and New Regency to produce a feature film of Noah with a budget of $130 million. Screenwriter John Logan was asked to re-draft the script alongside Aronofsky but is not credited for his contributions. In October 2012, Emma Watson commented on the setting of the film: "I think what Darren's going for is a sense that it could be set in any time. It could be set sort of like a thousand years in the future or a thousand years in the past. ... You shouldn't be able to place it too much." Aronofsky had previously offered the role of Noah to Christian Bale and Michael Fassbender, both of whom were unable to take the part due to previous commitments. Bale went on to star as Moses in Ridley Scott's religious epic film Exodus: Gods and Kings. Dakota Fanning was originally cast in the role of Ila, but departed due to a scheduling conflict. Julianne Moore was also considered for the role of Naameh. Liam Neeson, Liev Schreiber, and Val Kilmer were also considered for the part of Tubal-cain. Aronofsky reportedly wanted an actor "with the grit and size to be convincing as he goes head-to-head against Crowe's Noah character". Principal photography began in July 2012 in Dyrhólaey, Fossvogur, Reynisfjara, and other locations in southern Iceland. Filming also took place in New York state. A set representing Noah's Ark was built at the Planting Fields Arboretum in Upper Brookville, New York. In September 2012, while on break from a location on Long Island, Russell Crowe and a friend, both of whom had been kayaking for several hours, were rescued by the Coast Guard near Cold Spring Harbor. Production was put on hold while Hurricane Sandy subjected New York to heavy rain and flooding during late October 2012. Post-production lasted over 14 months, with Aronofsky attempting some of the most complicated and extensive effects ever used in film. Industrial Light and Magic (ILM) said their work on the film represented "the most complicated rendering in the company's history." To make the fallen angels' movements realistic, VFX supervisor Ben Snow and Aronofsky studied footage of real ballet dancers from the director's Oscar-winning drama Black Swan. Snow and ILM also teamed for the movie's water scenes. "We created this great effect of geysers from the ground shooting water that meets rain falling to Earth," said Snow. "That's the thrill: to create something you've never done, or something people have never seen." Regarding the film's extensive use of visual effects, Aronofsky said he and his crew "had to create an entire animal kingdom" using no real animals in the production but instead "slightly tweaked" versions of real creatures. Besides the fictional land-based animals in the film, ILM was also responsible for creating the Watchers, the forest that sprouted from the seed, the deluge sequence during the battle between the Watchers and Tubal-cain and his army, and the two-minute-long sequence of the history of Earth's creation. The musical score for Noah was composed by Clint Mansell, who scored the music for all of Aronofsky's previous feature films, and is performed by Kronos Quartet. A soundtrack album was released by Nonesuch Records on March 26, 2014. The score also features an original song by Patti Smith, which is a lullaby sung by both Russell Crowe and Emma Watson's characters during the film. Smith performs the song herself over the end credits. The story of Noah starts with this concept of strong justice, that the wickedness of man will soon be met with justice, and it ends when the rainbow comes and it says, even though the heart of man is filled with wickedness, I will never again destroy the world ... So it ends with this idea of mercy. God somehow goes from this idea of judging the wickedness to mercy and grace. So we decided that was a powerful and emotional arc to go through, and we decided to give that arc to Noah. Commenting on God's mercy, Wesley Hill in First Things notes that "near the end of the film, Emma Watson's character, Ila ... says to Noah that perhaps God preserved him because God knew that he had a merciful heart" and that "the film ends up locating the rationale for God's mercy in some native spark of goodness in Noah that will, viewers hope, make the new, post-flood world more livable than the antediluvian one." In mid-2013, Aronofsky and Paramount began sparring over final cut, with Paramount seeking to test unfinished, unscored, and alternate cuts of the film despite Aronofsky's objections. Paramount proceeded with test-screening the film nonetheless, prompting "worrisome" responses from largely religious audiences in October 2013. "They tried what they wanted to try, and eventually they came back. My version of the film hasn't been tested ... It's what we wrote and what was green-lighted." After much discussion and compromise, the studio announced on February 12 that Darren Aronofsky's version, not any of the studio's alternate versions, would be the final cut of Noah. "The film is inspired by the story of Noah. While artistic license has been taken, we believe that this film is true to the essence, values and integrity of a story that is a cornerstone of faith for millions of people worldwide. The biblical story of Noah can be found in the book of Genesis." Noah had its world premiere in Mexico City on March 10, 2014. In North America, the film grossed a little over $43.7 million during its opening box office weekend, becoming Aronofsky's highest opening weekend and his first film to open at No. 1. The opening weekend was also the biggest ever for Russell Crowe as a lead actor. Overseas, the film's releases in Russia and Brazil were the largest-ever for a non-sequel, and were the fourth-biggest openings of all time with $17.2 million and $9.8 million, respectively. The opening in Russia was the largest-ever for a Paramount film. In South Korea, the film grossed $1.1 million on its opening day, the highest in 2014 for the territory. Noah grossed $101.2 million in North America and $261.4 million in other countries, making a worldwide gross of $362.6 million. The film was declared "an unmitigated hit ... by almost every measure." In connection with the release of the film in North America, Aronofsky commissioned artists to create original works inspired by the Biblical story of Noah, stating that "The Noah story belongs to all of us—every religion, every culture, every citizen of planet Earth." The collection, titled Fountains of the Deep: Visions of Noah and Flood was open to the public for the month of March 2014 in the Soho district of New York City. Contributing artists included Ugo Rondinone, Karen Kilimnik, Mike Nelson, Nan Goldin, Jim Lee, Robert Liefeld, Jim Woodring, Simon Bisley, graffiti duo FAILE and James Jean. On the eve of the film's release in Reykjavik, Iceland, Aronofsky teamed up with Björk to host an environmental benefit concert in response to proposed anti-conservationist policy changes by the Icelandic government, with guest performances by Björk, Patti Smith, Lykke Li, Russell Crowe, and Of Monsters and Men. The review aggregator website Rotten Tomatoes reported a 76% approval rating with an average rating of 6.7/10 based on 224 reviews. The website's consensus reads, "With sweeping visuals grounded by strong performances in service of a timeless tale told on a human scale, Darren Aronofsky's Noah brings the Bible epic into the 21st century." On Metacritic, the film has a score of 68 out of 100, based on 46 critics, indicating "generally favorable reviews". Movieline's Pete Hammond said that "It stays with you long after you leave the theatre. This 'Noah' is unlike any other film of its kind—an intimate and stirring new take on a biblical story we only thought we knew. "[unreliable source?] Peter Travers of Rolling Stone said of the film: "a film of grit, grace, and visual wonders that for all its tech-head modernity is built on a spiritual core ... In this flawed, fiercely relevant film, wonders never cease." Time's Richard Corliss said, "Darren Aronofsky brings out wild ambition and thrilling artistry to one of the Old Testament's best-known, most dramatic, least plausible stories- Noah and the Ark- with Russell Crowe infusing the role of God's first seaman and zookeeper with all his surly majesty." Kathleen Parker, writing in The Washington Post, called the movie "Noah's Arc of Triumph" and said of the film: "If you like Braveheart, Gladiator, Star Wars, The Lord of The Rings, Indiana Jones, or Titanic, you will like Noah. If you like two or more of the above, you will love Noah." Richard Roeper called it "One of the most dazzling and unforgettable Biblical epics ever put on film." The movie also had its detractors. IndieWire claimed "Aronofsky's worst movie is an epic misfire that, like the source material, offers plenty of lessons even if you don't buy the whole package." The Wrap called the film "Darren Aronofsky's Biblical Waterworld". The New Yorker's David Denby wrote: "Darren Aronofsky's 'Noah'- an epic farrago of tumultuous water, digital battle, and environmentalist rage ... is the craziest big movie in years. 'Noah' may not make much sense, but only an artist could have made it." The film was challenged for its lack of non-white characters. Reverend Wil Gafney, associate professor of Hebrew and Old Testament at the Lutheran Theological Seminary at Philadelphia, sees the film as a throwback to the Hollywood era of all white casts and considers it worrisome in today's more multi-ethnic America. She goes on to state that "The Bible is the most multicultural piece of literature that most people will ever read. So a film about the Bible should reflect that diversity." Efrem Smith, of Los Angeles-based World Impact, critiques the film as a throwback to the 1956 classic The Ten Commandments, where an all-white cast played Moses and Pharaoh. Smith states that Noah deals with the curse of Ham by "simply erasing people of color from the story." Anthea Butler, an associate professor of religious studies at the University of Pennsylvania, said the casting choices send a worrying message: "It's a world where only white people get saved ... this doesn't look like the world that God created." However, "fittingly for a Biblical story", two of the characters are played by Jewish actors (Jennifer Connelly and Logan Lerman). Co-writer Ari Handel addressed the issues around race in an interview, where he stated, "From the beginning, we were concerned about casting, the issue of race. What we realized is that this story is functioning at the level of myth, and as a mythical story, the race of the individuals doesn't matter." Justin Welby, Archbishop of Canterbury and leader of the worldwide Anglican Communion, called the Noah film "interesting and thought-provoking" after the film's lead star, Russell Crowe travelled to Lambeth Palace in order to discuss with him "faith and spirituality" after the film's British premiere. In addition, several Christian organizations have expressed support for the Noah film, "including leaders from organizations like the American Bible Society, National Catholic Register, The King's College, Q Ideas, Hollywood Prayer Network, and Focus on the Family." Focus on the Family president Jim Daly stated that: "[Noah] is a creative interpretation of the scriptural account that allows us to imagine the deep struggles Noah may have wrestled with as he answered God's call on his life. This cinematic vision of Noah's story gives Christians a great opportunity to engage our culture with the biblical Noah, and to have conversations with friends and family about matters of eternal significance." Cultural commenter Fr. Robert Barron praised the film for its inclusion of "God, creation, providence, sin, obedience, salvation: not bad for a major Hollywood movie!" Rabbi Shmuley Boteach, an orthodox Jewish rabbi leader, hailed Noah as "a valuable film, especially for our times." In order to create "a story that tries to explicate Noah's relationship with God and God's relationship with the world as it has become", director of the film Darren Aronofsky himself stated that he was working in "the tradition of Jewish Midrash". Noah has also been the subject of controversy with Christians who take issue with how the story has been portrayed. This is primarily in how the film used extra-biblical non-canonical Jewish sources as inspiration for elements of the script and not just the book of Genesis. In particular the movie heavily incorporated elements of the Book of Enoch's version of the story including, but not limited to, the Nephilim. Ken Ham and Ray Comfort, both young earth creationists, objected to the film, with the latter apologist creating his own documentary, Noah and the Last Days as a response. 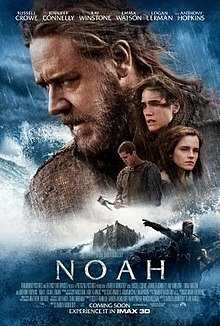 The director angered many in the religious community by stating that his version of "Noah" was the "least-biblical biblical film ever made". Despite references to "The Creator", some still disliked the movie because God is not mentioned by name. Jerry Johnson, president of the National Religious Broadcasters, did not like the director's description of Noah as the "first environmentalist". Johnson called the film's "insertion of the extremist environmental agenda" a major concern. Christian blogger Michael Snyder claims that the film "promotes the Luciferian Gnostic belief that the Creator of this world is evil". Producer Scott Franklin told Entertainment Weekly, "Noah is a very short section of the Bible with a lot of gaps, so we definitely had to take some creative expression in it. But I think we stayed very true to the story and didn't really deviate from the Bible, despite the six-armed angels." Kevin Hall, Ph.D., professor of biblical and theological studies and the Ida Elizabeth and J.W. Hollums chair of Bible at Oklahoma Baptist University observed that "the story in Genesis is extremely concise, so some creativity with the tale—especially by Hollywood—is hardly a surprise." The film was banned in Bahrain, Kuwait, Qatar, Saudi Arabia, United Arab Emirates, Malaysia, and Indonesia prior to its release because it is seen by the governments of those countries as contradicting the teachings of Islam. A representative of Paramount Pictures stated, "Censors for Qatar, Bahrain and the UAE officially confirmed this week that the film will not release in their countries." The film was also disapproved by the Al-Azhar University in Egypt since it violates Islamic law and could "provoke the feelings of believers". Mohammad Zareef from Pakistan's Central Board of Film Censors said they tended to steer clear of films with a religious theme, adding, "We haven't seen it yet, but I don't think it can go to the cinemas in Pakistan." However, the DVD release will be available in Pakistan. In many Islamic juristic schools, the portrayal of prophets such as Noah is forbidden. Noah was released on Blu-ray Disc and DVD on July 29, 2014. In August 2014 a 3D Blu-ray edition was also released in Italy and Germany. ^ "NOAH (12A)". Paramount Pictures. British Board of Film Classification. Retrieved March 30, 2014. ^ "Noah (2014)". Box Office Mojo. Retrieved April 1, 2014. ^ Child, Ben (March 11, 2014). "Studio cut of Noah 'featured religious montage and Christian rock song'". The Guardian. ^ "Noah (2014)". Box Office Mojo. Retrieved June 24, 2014. ^ Chitwood, Adam (October 25, 2012). "First Look at Ray Winstone on the Set of Darren Aronofsky's NOAH [Updated with Images of Russell Crowe, Douglas Booth, and Logan Lerman]". Collider.com. Retrieved August 20, 2013. ^ Mendelson, Scott (February 6, 2014). "Paramount's 'Noah' To Go 3D, But Not In America". Forbes. Retrieved March 29, 2014. ^ Nathan, Fred (May 9, 2014). "Noah denied release in China". The Daily Telegraph. Retrieved June 26, 2017. ^ a b "Movie Banned in Bahrain, Qatar and UAE". Reuters. March 8, 2014. Retrieved April 8, 2014. ^ Skorin-Kapov, Jadranka (2015). Darren Aronofsky's films and the fragility of hope. New York: Bloomsbury Academic. p. 141. ISBN 9781501306976. OCLC 931624985. ^ Ng, Philiana (April 22, 2012). "It's Official: Russell Crowe to Star in Darren Aronofsky's 'Noah'". The Hollywood Reporter. Retrieved July 25, 2012. ^ Jagernauth, Kevin (July 19, 2012). "Kevin Durand, Marton Csokas & Dakota Goyo Book Passage On Darren Aronofsky's 'Noah'". indiewire.com. Retrieved July 25, 2012. ^ Jagernauth, Kevin (June 18, 2012). "Jennifer Connelly Officially In Talks For Darren Aronofsky's 'Noah'". indiewire.com. Retrieved July 25, 2012. ^ a b Child, Ben (June 12, 2012). "Ray Winstone set to star opposite Russell Crowe in Noah's ark epic". The Guardian. Retrieved July 25, 2012. ^ Truitt, Brian (August 10, 2012). "'Noah' director Aronofsky tweets up a storm". USA Today. Retrieved August 10, 2012. ^ Nepales, Ruben V (September 15, 2012). "Emma Watson shares updates on 'Bling Ring,' 'Noah' and '50 Shades'". Philippine Daily Inquirer. Retrieved September 15, 2012. ^ Scott, A. O. (March 27, 2014). "Russell Crowe Confronts Life's Nasty Weather in 'Noah'". Retrieved September 15, 2017 – via www.nytimes.com. ^ a b Fleming, Mike (June 4, 2012). "Douglas Booth And Logan Lerman Board Boat For 'Noah'". Deadline Hollywood. Retrieved July 25, 2012. ^ Chitwood, Adam (June 9, 2012). "Anthony Hopkins to Play Methuselah in Darren Aronofsky's NOAH". collider.com. Retrieved July 25, 2012. ^ The Deadline Team (July 18, 2012). "Marton Csokas Cast In 'Rogue', 'Noah'". Deadline Hollywood. Retrieved July 25, 2012. ^ "Marton Csokas Bio" (PDF). Sue Barnett & Associates. April 24, 2013. Retrieved April 24, 2013. ^ Patten, Dominic (August 9, 2012). "Movie Casting Round-Up: 'Noah' Adds A Wife, 'The Heat' Adds A Villain". Deadline Hollywood. Retrieved August 13, 2012. ^ Scott, A. O. (March 27, 2014). "Rain, Heavy at Times: Russell Crowe Confronts Life's Nasty Weather in 'Noah'". The New York Times. Retrieved March 29, 2014. ^ a b "Nolte joins Noah at last minute". The Irish Independent. January 16, 2014. Retrieved January 16, 2014. ^ a b c d e Bailey, Sarah Pulliam (March 28, 2014). "A conversation with Noah director Darren Aronofsky". The Washington Post. Retrieved April 6, 2014. ^ Gilbey, Ryan (April 27, 2007). "Just say Noah". The Guardian. Retrieved July 25, 2012. ^ "HORS COLLECTION LE LOMBARD". Le Lombard. Retrieved July 29, 2012. ^ Sciretta, Peter (October 3, 2011). "Paramount and New Regency to Make Darren Aronofsky's $150 Million Biblical Epic 'Noah'". slashfilm.com. Retrieved July 25, 2012. ^ Fischer, Russ (October 20, 2011). "First Volume of Graphic Novel Version of Darren Aronofsky's 'Noah' Available in Europe; See Pages and a Trailer". slashfilm.com. Retrieved July 25, 2012. ^ Douglas, Edward (November 21, 2011). "Exclusive: John Logan on Noah and Skyfall". comingsoon.net. Retrieved July 25, 2012. ^ Maytum, Matt (October 3, 2012). "Emma Watson on her future projects: video interview". totalfilm.com. Retrieved October 4, 2012. ^ Sneider, Jeff (November 30, 2011). "Christian Bale passes on 'Noah'; Fassbender in?". Variety. Retrieved July 25, 2012. ^ a b Sneider, Jeff (June 7, 2012). "Emma Watson called to 'Noah' role". Variety. Retrieved July 25, 2012. ^ Hnefill, Örlygur (August 6, 2012). "Russell Crowe and Emma Watson filming in Iceland". goiceland.is. Retrieved August 7, 2012. ^ "Darren Aronofsky's 'Noah' Begins Filming – Starring Russell Crowe, Ray Winstone & Emma Watson". flicksandbits.com. July 20, 2012. Archived from the original on July 25, 2012. Retrieved August 10, 2012. ^ "First look at the set of 'Noah' in New York". On Location Vacations. July 20, 2012. Retrieved July 29, 2012. ^ "Russell Crowe gets lost on kayaking trip". BBC News. September 3, 2012. Retrieved September 3, 2012. The coastguard officers lifted the pair and their kayaks into the boat and ferried them to Huntington Bay, 10 miles from where the pair had set out on their trip. ^ "Sandy halts production of Darren Aronofsky's 'Noah'". CNN. October 30, 2012. Retrieved April 8, 2014. ^ a b Scott Bowles (November 25, 2014). "Almighty Affect Noah and Exodus: Gods and Kings presented VFX challenges of biblical proportions". Deadline.com. Retrieved December 28, 2014. ^ Masters, Kim. Darren Aronofsky, Paramount Spar Over 'Noah' Final Cut (Exclusive). The Hollywood Reporter. October 15, 2013. Retrieved October 16, 2013. ^ Failes, Ian. "Character Ark: the visual effects of Noah". fxguide. Retrieved April 28, 2014. ^ Jagernauth, Kevin (December 11, 2012). "Darren Aronofsky Confirms Clint Mansell Is Scoring 'Noah,' Discusses Their Working Relationship". indiewire.com. Retrieved December 11, 2012. ^ a b "'Noah' Soundtrack Details". Film Music Reporter. March 13, 2014. Retrieved March 13, 2014. ^ a b Warren Cole Smith (February 25, 2014). "Signs and Wonders: Noah needs 'based on a true story' disclaimer". WORLD. Retrieved March 25, 2014. ^ Billy Hallowell (February 26, 2014). "Honest Assessment of New 'Noah' Movie". TheBlaze. Retrieved March 25, 2014. For instance, at one point Noah is preaching to his family and telling the story of creation – one that is presented through an evolutionary lens, albeit a theistic one. ^ Alter, Charlotte (March 24, 2014). "'Noah' Movie Approved by Religious Leaders". Time. Retrieved March 25, 2014. ^ Hill, Wesley (March 31, 2014). "A Pauline Exegete Watches Aronofsky's Noah | First Thoughts". First Things. Retrieved April 8, 2014. ^ Friend, Tad. "HEAVY WEATHER: Darren Aronofsky gets Biblical". The New Yorker. ^ a b "Rough Seas on 'Noah': Darren Aronofsky Opens Up on the Biblical Battle to Woo Christians (and Everyone Else)". The Hollywood Reporter. February 12, 2014. Retrieved February 19, 2014. ^ a b Hinton, Carla (March 29, 2014). "Flood of imagery: 'Noah' movie goes beyond familiar Sunday school Bible story". News OK. Retrieved April 1, 2014. ^ "'Noah' World Premiere in Mexico City Gets Mixed Reception". The Hollywood Reporter. Retrieved April 1, 2014. ^ Boxoffice Media, Llc (March 28, 2014). "BoxOffice — Noah". Boxoffice.com. Archived from the original on April 7, 2014. Retrieved April 8, 2014. ^ Stiles, Nancy. ""Noah" on Track to Be the Biggest Opening of Russell Crowe's Career". Complex Magazine. Retrieved May 27, 2014. ^ Tartaglione, Nancy. "'Noah' Crosses $300M In Global Box Office". Deadline Hollywood. Retrieved May 27, 2014. ^ Nikara, Johns. "'Noah' Has Strong Start in South Korea With $1.1 Million". Variety. Retrieved May 27, 2014. ^ Box Office Mojo. "Noah (2014) - Box Office Mojo". boxofficemojo.com. Retrieved June 20, 2014. ^ Bowles, Scott. "'Noah' is a hit, yet film fans may not believe in it". USA Today. Retrieved May 27, 2014. ^ Billington, Alex. "Take a Look Inside Darren Aronofsky's Stunning NYC Noah Art Show". FirstShowing.net. Retrieved May 28, 2014. ^ Shannen, Lisa. "Darren Aronofsky's Noah to Premier in Reykjavik With Special Guest Performances by Bjork, Patti Smith & Lykke Li". Retrieved May 27, 2014. ^ "Noah (2014)". Rotten Tomatoes. Retrieved April 17, 2014. ^ "Noah Reviews". Metacritic. Retrieved March 31, 2015. ^ van Movieline. "Noah 2014 Movie Review". YouTube. Retrieved April 8, 2014. ^ Peter Travers (March 27, 2014). "'Noah' Movie Reviews". Rolling Stone. Retrieved April 8, 2014. ^ Corliss, Richard. "Darren Aronofsky's Noah Movie: Better Than the Book". Time. Retrieved May 27, 2014. ^ Parker, Kathleen. "Noah's arc of triumph". The Washington Post. Retrieved May 27, 2014. ^ "Noah". www.richardroeper.com. Retrieved October 10, 2016. ^ "Review: Darren Aronofsky's 'Noah' Is a Biblical Mess, But That's What Makes It Worth Talking About". Indiewire.com. October 26, 2012. Retrieved April 8, 2014. ^ "'Noah' Review: Darren Aronofsky's Biblical 'Waterworld' Mostly Runs Aground (Video)". TheWrap. Retrieved April 8, 2014. ^ Denby, David (April 7, 2014). "MAN OVERBOARD". The New Yorker (April 7th, 2014): 74. Retrieved May 27, 2014. ^ a b Smietana, Bob. "Does 'Noah' Have A Race Problem? Biblical Film Draws Criticism For Lack Of Diversity". Huffington Post. Retrieved August 8, 2014. ^ "Is 'Noah' 2014's most controversial film?". MSNBC. Retrieved October 10, 2016. ^ Smietana, Bob (April 7, 2014). "Critics find 'Noah' lacking in ethnic diversity". The Christian Century. Retrieved October 10, 2016. ^ Miller, Gerri (March 21, 2014). "Hollywood Now: Divergent, Noah and It Felt Like Love". InterfaithFamily. Retrieved November 19, 2015. ^ "'Noah' Co-Writer Ari Handel Explains (Badly) Why There Weren't Any Black People In Noah". UPROXX. April 15, 2014. Retrieved October 10, 2016. ^ "Crowe meets Anglican leader after 'Noah' premiere". London: ADN. Associated Press. April 1, 2014. Archived from the original on April 7, 2014. Retrieved April 2, 2014. ^ "Russell Crowe meets archbishop to discuss Noah film". British Broadcasting Corporation (BBC). April 1, 2014. Retrieved April 2, 2014. ^ "'Noah' Film Receives Praise From Christian Evangelicals Unfazed By 'Creative Interpretation'". Huffington Post. March 22, 2014. Retrieved March 25, 2014. ^ Charlotte Alter (March 24, 2014). "'Noah' Movie Approved by Religious Leaders". Time. Retrieved April 8, 2014. ^ Barron, Robert. "Noah: A Post-Modern Midrash". wordonfire.org. ^ Hoffman, Jordan (March 27, 2014). "Hollywood 'Noah' is kosher, says celebrity rabbi". The Times of Israel. Retrieved April 1, 2014. I think it is a valuable film, especially for our times. ^ "For his hot-button 'Noah,' Darren Aronofsky gave ark builder an arc". Los Angeles Times. Retrieved April 1, 2014. Working in what he calls "the tradition of Jewish Midrash" (stories based on the Bible by scholars), in which he and Handel work to fill gaps in the biblical narrative, Aronofsky created a story that tries to explicate Noah's relationship with God and God's relationship with the world as it has become. ^ Thompson, Jen (March 25, 2014). "Ray Comfort: 'Noah' Movie Listed as Entertaining 'Fantasy' in Hollywood". Charisma Magazine. Retrieved April 1, 2014. ^ "Christian Filmmaker Ray Comfort Blasts Hollywood's 'Noah' Movie; Will Release His Own Film on Noah". The Christian Post. March 2, 2014. Retrieved April 1, 2014. Oscar-winning actor Russell Crowe has urged Pope Francis to watch his biblical epic "Noah," but Christian evangelist and award-winning filmmaker Ray Comfort says the "sensational" film cannot be called a "biblical adventure." Comfort has produced his own version of "Noah." ^ Ham, Ken. "Ken Ham: The Unbiblical Noah Is a Fable of a Film". Time. Retrieved April 1, 2014. ^ a b "Russell Crowe hits 'Noah' critics: 'Bordering on absolute stupidity'". The Washington Times. March 27, 2014. Archived from the original on March 4, 2016. Retrieved March 27, 2014. ^ Chumley, Cheryl K. (March 24, 2014). "Atheist 'Noah' director brags film is least biblical Bible movie ever". The Washington Times. Archived from the original on March 30, 2016. ^ ""Noah" Promotes The Luciferian Gnostic Belief That The Creator Of This World Is Evil – The Truth". thetruthwins.com. Retrieved September 15, 2017. ^ Smith, Grady (January 25 – February 1, 2013). "Hollywood Finds God (Again)". Entertainment Weekly. New York. p. 22. Archived from the original on November 23, 2015. ^ "Middle East ban for Hollywood's Noah epic". BBC News. Retrieved March 13, 2014. ^ "Middle East ban for Hollywood's Noah epic". BBC News. March 13, 2014. Retrieved October 10, 2016. ^ "Noah film should be banned says Egypt's top Islamic body". The Telegraph. Retrieved March 20, 2014. Noah is also banned in Indonesia, with the censorship institution stating "religious reasons" for the ban but declining to further comment on the matter.